High quality wine produced from specially selected grapes of Plavac Mali from the best and oldest southern positions of Hvar vineyards older than 30 years. The average yield per vine is 0.5 kg. It ages in new barrique barrels capacity of 225 l. Best barrels of French, American and Croatian descent and another half a year in the bottle are combined. The wine is dark ruby color rich and complex aromas which give the impression of prunes, vanilla and leather. Rich and powerful tannic structure, fire retro taste with persistence that stays long. Food pairing: Roasted Fish, game, steaks, as well as a fine white meat dishes. In 1991 the Plenković family formed a horticulture company named Vitis, later changed the name to Zlatan Otok. Zlatan is a first name and Otok refers to island. Zlatan Plenkovic is the owner and winemaker. He has won the Croatian Winemaker of the Year award and has continued to place first or second since the award was started. Zlatan Plenkovic comes from a long history of family winemaking. In 1985 he decided to start making his own wines. The first vineyards of the Plenkovic Winery have occupied slopes that are up to a 40 to 60 percent incline on the southern coast of the island. 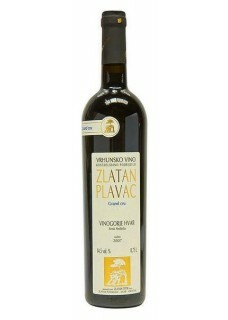 Besides the initial Hvar, Zlatan has vineyards in the region of Makarska and Šibenik. Today he is producing around 900.000 bottles a year. Since the foundation of the award »Best Croatian winemakers« Mr. Zlatan Plenković was annually among the best. In the year 2009 Mr. Zlatan Plenkovic was elected as Croatian wine knight and by the statute he entered into the order of great splendors of winemakers and can no longer compete for the winemaker of the year.